Toslink connector on the Device has a Little door on the cover to keep dust out. Connect lights up when sending Audio Data. 5 Meter ~ 15 Feet Length Premium Audio Fiber Cable. Includes both Toslink and 3.5 Digital Connectors on Both Sides. 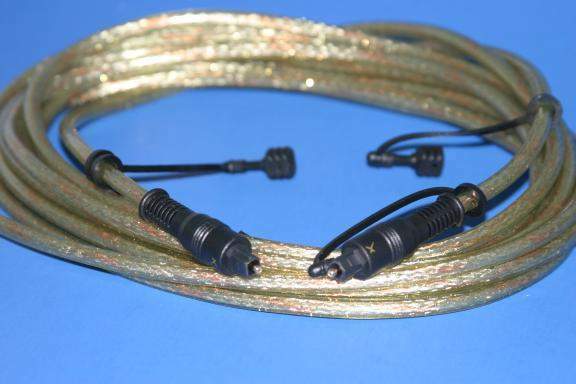 5M ( 16 FEET ) TOSLINK DIGITAL Optical cables are a must-have for any audio enthusiasts. Constructed of a High-Purity optical grade fiber, it offers an excellent signal transmission. The manufacturing process employs a sophisticated lens-polishing to make the clearest end possible. Purchase PCCABLES.COM Toslink Cables Today. Primarily used to connect audio equipment like: Audio receivers, DVD players, SACD players SAT top boxes and cable boxes or any audio equipment that would utilize this type of connection. These techniques result in minimal error even with a highly distorted signal. Toslink cables are immune to Electromagnetic Interference and Radio Frequency Interference which are common to standard Audio/Video cables.